The owner of the former Zion United Church says he has no plans to tear down the heritage building. 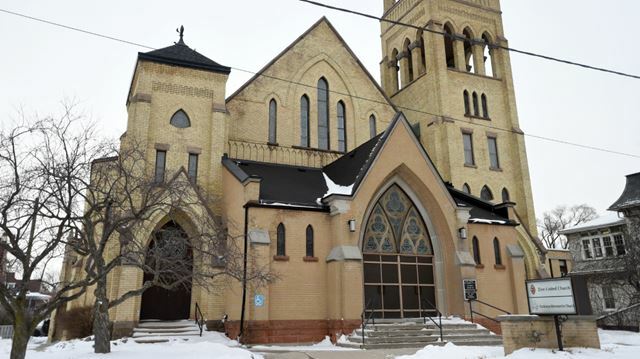 KITCHENER — The owner of the former Zion United Church on Weber Street says it would be a great location for tech firms or a private school, and says he has no plans to tear down the heritage building. The sprawling complex of yellow-brick buildings at 32 Weber St. W. near Queen Street is a designated heritage site that dates back to 1893 and is associated with several prominent early families. The site includes two sanctuaries that can each seat about 750 people, a chapel, a full-service kitchen, a gymnasium and a warren of classrooms and meeting rooms. Developer Krish Judge bought the complex in 2015, the same year the church closed, and says he still has no immediate plans for redevelopment. He said he doesn’t plan to sell the building or to demolish it. He sees several potential uses for the site, including a private school that could take advantage of the classrooms, gym and kitchen. He also sees potential as a site that’s rented out for community events such as meetings or weddings, or for tenants in the tech sector. There is one tenant, Big Bliss Yoga, renting space at the former church. Judge said he has been approached by people interested in opening a bar or nightclub, but felt it wasn’t appropriate for a former place of worship. The city has an interest in seeing the property get new life, said Cory Bluhm, Kitchener’s interim executive director for economic development. Any development would need to take two things into account, however, he said. While the church is in a prominent location on Weber, very close to a planned light rail stop at city hall, the property extends back from Weber onto Roy Street, an established neighbourhood lined with homes. Any redevelopment would have to fit with the neighbourhood — a highrise condo next to the two-storey homes, for example, would be out of the question. “It’s definitely not an easy site,” Bluhm conceded. “It’s going to take a creative person” to come up with a proposal in a site such as this, with its unique features and more complex constraints.